What would an instrument designed for digital music look like? That question has been bothering Japanese media artist Toshio Iwai since 1985, and his vision has finally come true with the worldwide launch in the UK of Tenori-On. This is a 16 x 16 grid of buttons lit by white LEDs that produces a range of 253 synthesized 'voices', half from Yamaha's existing synthesisers and half specially developed for the system. The basic array plots pitch vs time, but there are 16 layers for different, complex ways to manipulate sounds and the array also displays the notes as they play. One of these includes the ability to rotate the notes while maintaining their relationship in time (see videos below for more examples). "In the digital age the problem of developing a musical instrument is one of developing a unique shape like a piano or saxophone has a unique shape," said Iwai. "The problem is that in the digital world everything is inside a black box and you can't get the physical feeling from that digital world. The new musical instrument for the 21st century has to have a relationship between shape, sound and interface and these have to match beautifully." He has been working with Yamaha to turn it into a product for the last four years. Th £599 instrument is only available in the UK as the test market through 8 record shops, including Rooted Records in Bristol, as well as being sampled by South West music guru Peter Gabriel. IBM nanotech researchers have stumbled onto something that may make a significant difference to the design and manufacture of logic devices in the future. Researchers looking at the vibration of the Naphthalocyanine molecule found that they could use two hydrogen atoms in the organic molecule to switch states, providing an 1 or a 0. They have tried with many other molecules but previously it always changes shape which makes the switch unreliable. 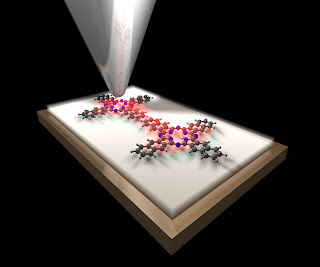 In the paper titled “Current-Induced Hydrogen Tautomerization and Conductance Switching of Naphthalocyanine Molecules,” in the US journal Science, IBM researchers describe the switching, and are saying that these molecular switches could one day lead to computer chips with speeds as fast as today's fastest supercomputers, but much smaller in size; with some speculating even building computer chips so small they could be the size of a speck of dust or fit on the tip of a needle. The next step is to build a series of these molecules into a circuit, then figure out how to network those together into a molecular chip. However, the trick is to propagate the state through multiple molecules to build logic gates where one molecule influences another, and that is difficult. I would also be surprised if this could be done at the kinds of speeds researchers are talking about and that the industry needs. Plus, this is an organic molecule and sensitive to heat, so there are many environmental issues to be tackled before we are anywhere near building computers out of single molecules of Naphthalocyanine. An interesting element of the recent launch of a family of SD video codec cores from ARC is the use of 'graceful degradation' in the encoding process. Depending on the resources available - and that can be power or memory - the cores can throw out various tools and reduce the quality of the encoding to extend the battery life or the recording time - this is all up to the designer and allows systems based on the cores to be differentiated through these engineering tradeoffs. All this is very interesting when video becomes a key IP block for the next decade. Researchers at the Fraunhofer Institute for Integrated Circuits IIS in Erlangen, Germany, have developed a way of harnessing natural body heat to generate electricity to power low voltage logic devices. While this won't power a cell phone, medical sensors may be able to function without power from a wall socket. Instead, they will draw all the power they need from the warmth of the human body. The respective data will be sent by a radio signal to the central monitoring station. The researchers, with collleagues at the Fraunhofer Institute for Physical Measurement Techniques IPM and the Fraunhofer Institute for Manufacturing Engineering and Applied Materials Research IFAM, are using thermoelectric generators, TEG for short, made from semiconductor elements that extract electrical energy simply from the temperature difference between a hot and a cold environment. Normally, a difference of several tens of degrees would be required in order to generate enough power, but the differences between the body’s surface temperature and that of its environment are only a few degrees. To tackle deeply embedded and power sensitive applications, VIA has launched a 500MHz x86 processor that runs at under 1W. The Eden ULV processor has been designed from the ground up to meet the low power requirements of a wide range of industrial, commercial and ultra mobile applications and has an idle power of 100mW.The 1W power level allows a 21mm x 21mm NanoBGA2 package to be used for more space sensitive applications. 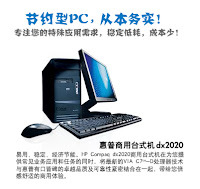 The new processor can be combined with the ultra compact VIA CX700/M system media processor, an advanced all-in-one digital media chipset with a maximum operating power of just 3.5 watts, supporting a wide range of multimedia, connectivity and storage options and enabling system platforms with a maximum power of less than 10 watts. AAEON, Acrosser, Adlink, Advansus, Advantech, Aquila, Arbor, Avalue, Axiomtek, Biostar, Bona, Boser, Commate, E-TOP, Flexus, Freetech, Ibase, IEI, Inhand, IPOX, Kontron, Lanner, Liantec, Maple, Nexcom, Posiflex, Portwell, Termtek, Unication and Unicorn. 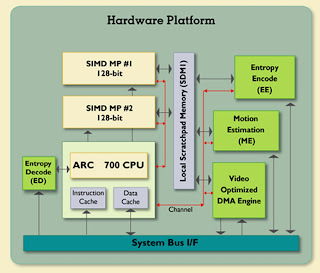 Integrated into the processor is the VIA StepAhead Technology Suite, which boasts an extensive array of performance-enhancing features including the VIA V4 bus at 400MHz, sixteen pipeline stages, branch prediction and an efficiency-enhanced 128KB full-speed exclusive L2 cache, ensuring the processor’s low power consumption doesn’t come at the expense of performance. It also integrates VIA's PadLock Security Engine security tools to enable real-time military-grade encryption of data such as AES encryption, Secure Hash Algorithm SHA-1 and SHA-256, and a Montgomery Multiplier to accelerate the encryption process used under RSA and other public key transmissions as well as NX Execute Protection to prevent worms from propagating, and dual quantum based random number generators. The transformation of LSI Logic has settled down with the last remaining element - the GSM chip business - sold off to Infineon Technologies for what looks like a knock down price. The E330m (£235m) deal is expected to close in Q4 and is for roughly the same as the project sales this year (the first six months saw sales of E150m), and Infineon expects a clearly positive EBITA contribution in 2008. The 700 strong Mobility Products Group came from the April 2007 acquisition of Agere, and includes a design team and sales and marketing operation in Bracknell in the UK. Whether this becomes a standalone group for Infineon or merges with the Infineon design group in Bristol remains to be seen. Another question is what this means for the comms element of the BlueOnyx strategy of a mobile server - that relied heavily on the Bluetooth and GSM element that came from the Mobility group, coupled with the storage capabilities of LSI. But buying in modules from a stronger player such as Infineon should not be a problem. Following the carve-out of Qimonda in 2006, Infineon is focusing on three key areas of business: Energy Efficiency, Communications and Security, having acquired Texas Instruments’ DSL CPE business earlier this year. In the Communication Solutions segment, Infineon has picked up new customers including Nokia, LG-Electronics, Panasonic and Samsung. Embedded software tool vendor National Instruments has developed a multi-core version of its LabView graphical programming tool for the x86 architecture. LabView 8.5 adds multicore support for PCs, embedded boards based on X86 processors and FPGA development systems. Running threads across multiple cores is allowing significant speed up of applications developed on the PC, such as test systems. More importantly for embedded designed, NI has also made its real time operating system multi-core aware so that processes can be allocated to individual cores either manually or automatically to make the most of the system resources. With the parallel dataflow language of LabVIEW, users can easily map their applications to multicore and FPGA architectures for data streaming, control, analysis and signal processing. Building on the automatic multithreading capability of earlier versions, LabVIEW 8.5 scales user applications based on the total available number of cores and delivers enhanced thread-safe drivers and libraries to improve throughput for RF, high-speed digital I/O and mixed-signal test applications. LabVIEW 8.5 also provides symmetric multiprocessing (SMP) with the LabVIEW Real-Time environment where designers of embedded and industrial systems automatically can load balance tasks across multiple cores without sacrificing determinism. With the latest version of LabVIEW, users can manually assign portions of code to specific processor cores to fine-tune real-time systems or isolate time-critical sections of code on a dedicated core. To meet the more challenging debugging and code optimisation requirements of real-time multicore development, engineers and scientists can use the new NI Real-Time Execution Trace Toolkit 2.0 to visually display timing relationships between sections of their code and the individual threads and processing cores where the code is executing. The inherent parallelism of LabVIEW maps onto FPGA applications as well with an FPGA Project Wizard that automates I/O configuration, IP development and overall setup for common I/O, counter/timer and encoder applications. Using the FPGA Project Wizard, engineers and scientists can automate the generation of more complex high-speed DMA data transfer code. Additionally, LabVIEW 8.5 offers multichannel filtering and PID control functions commonly needed in machine automation to significantly reduce FPGA resources for high-channel-count applications. Statecharts are commonly used to design state machines to model the behaviour of real-time and embedded systems to depict event occurrences and responses for digital communication protocols, machine controllers and system-protection applications. LabVIEW 8.5 adds a new statechart module to help engineers and scientists design and simulate these event-based systems using familiar, high-level statechart notations based on the Unified Modeling Language (UML) standard. While this is not a move into full blown requirements capture and system modelling, it is a response to the recent acquisition of embedded UML tool provider Telelogic by IBM Rational. IBM is more focussed on the system and web software development, rather than embedded, and NI expects to pick up customers who used the I-logix state machine tool that was bought by Telelogic and so is now part of IBM Rational. Infineon Technologies is looking to take on Freescale Semiconductor's PowerPC chip in the engine management market in a move that is set to spark a price war. Infineon is looking for ways to make its TriCore embedded microcontroller even more cost effective as it continues to back the architecture, says Peter Bauer, head of the Automotive, Industrial and Multimedia (AIM) group and a member of Infineon's board of directors. AIM is the larger of the two groups in the company, bringing in 70% of the revenue. "We will discover how low in cost we can get the TriCore," he said, sparking a potential price war. "We believe we can bring TriCore to the lowest cost engine management designs." This is set to spark a price war if Freescale competes in price to keep its market share, but will bring sophisticated engine management technology to a wider range of vehicles in lower price brackets. Bauer claims Infineon has 60% of engine management designs using TriCore. 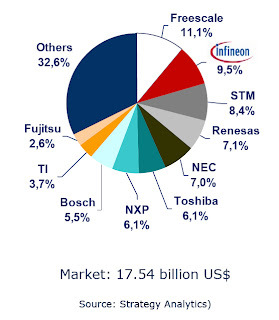 Infineon is currently the #2 automotive chip supplier in the world with a market share of 9.5%, behind Freescale's 11.2% (see global market right). 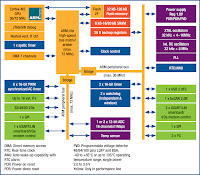 High performance logic company Intrinisty has used its high speed logic on the ARM cortex R4 core, but instead of gong for the highest possible speed has gone for a low power option. This is producing twice the clock speed possible with traditional logic, so the Cortex R4X core will run at 600MHz on TSMC's 65nm LP process. The processor implementations uses Intrinsity’s Fast14 1-of-N Domino Logic (NDL) technology, which enables faster circuit speeds while minimizing power consumption and area. This may well be an admission of defeat for Intrinsity, which has had a high performance MIPS version since it started 10 years ago now, but moved to a licensing model in 2004 and includes both processors and high speed memory. Moving to a low power approach makes sense for ARM, and the R4X is aimed at storage, printer and networking applications, so taking on MIPS which is more dominant in these areas. All versions of the Cortex-R4 processor offer embedded Error Correcting Code (ECC) technology which monitors memory accesses to detect and correct errors, providing very high reliability and availability. ARM says the Cortex-R4X processor implementations are available for licensing immediately, but will be shipped in Q1 next year. Expect other versions to follow, and an Intrinsity version of the Cortex A8 (the A8X perhaps, but more likely the A9) would hit 1.8GHz and perhaps top 2GHz on a high performance process. This technology looks vital to ARM, so expect Intrinsity to be an acquisition target. While it has licensed the technology to ATI (now part of AMD) and has investment from PowerPC licensee AMCC, neither of these are a major stumbling block to being part of ARM and fits well with the processor and IP design philosophy. If this proves popular, and there is little reason why not, then ARM cannot afford NOT to buy it. What's happening with Voice over IP? Just as it is reaching the mass consumer consciousness, there's a blip. The second largest standalone VOIP service provider, SunRocket (no I'd never heard of them either but they've been running since 1994 in the US) has closed without warning, reports Associated Press. if this was a small operator, that wouldn't matter, but with 200,000 subscribers it is second only to Vonage. Now who knows what the situation is (AP didn't) but the company fired Chief Technology Officer Mark Fedor and Chief Information Officer Robert Kramer at the end of June and then the chief financial officer, David Samuels, resigned on 2nd July - never a good sign! It has since laid off all 200 staff at its US call centre as well. This might be mismanagement, or internal 'problems', but hopefully not a technology issue and just a blip on the growth curve. But remember that IPTV is a good five years behind VoIP in its technology development. The electronics industry now has a global, open standard for scalable video that will allow the same bitstream to be used for many different devices and connections. This is potentially huge for the hardware, software and content industry as it can dramatically simplify the costs and implementation of providing video. The Scalable Video Coding (SVC) standard has been developed by the MPEG Joint Video Team (JVT) in collaboration with the International telecommunications Union and provides scalable video with full compatibility of base layer information so that it can be decoded by existing AVC decoders. The SVC design enables the creation of a video bitstream that is structured in layers so that devices can decode either the full bitstream or a subset of it with the removal of enhancement layers. Data remaining after the removal of enhancement layers is still decodable, and these scalability modes include higher frame rates, increase of picture resolution and higher quality. Unlike previous scalable compression solutions, the compression efficiency of SVC is very high and hardly distinguishable from "single-layer" AVC codecs in most operation modes. 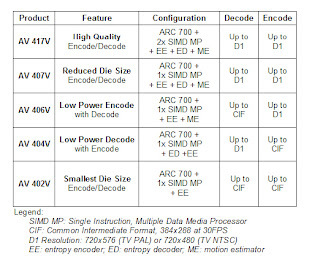 Due to a novel design which re-uses major components of ordinary AVC decoders and runs only one motion compensation loop, the complexity increase for supporting the scalability features in decoders is kept to a minimum, so decoders supporting SVC will not face a significant cost penalty. The standard is open and global, being approved as Amendment 3 of the Advanced Video Coding (AVC) standard ISO/IEC 14496-10 (also published as ITU-T Rec. H.264). A new amendment to MPEG-2 Systems also enables the carriage of scalable video data within MPEG-2 program and transport streams, and this is moving to the PDAM (proposed draft amendment) ballot stage of the ISO/IEC approval process. This allows the more efficient AVC video to be carried over MPEG-2 streams for higher spatial or temporal resolution, or higher picture fidelity at the same resolution. One application would be to provide broadcasters with the ability to efficiently deploy premium services without affecting their existing customer base. Set-top boxes with 1080p50/60 SVC capability on top of the existing HD AVC formats can be shipped to premium customers without the need to replace existing HD AVC set-top boxes. An interview in Gizmodo is offering the potential for an open source version of the multi-touch user interface software that is key to Microsoft's $10,000 Surface table PC. Developed by Peter Hutterer, a researcher in the Wearable Computers Lab at the University of South Australia, MPX or Multi-Pointer X is a modification of the X Windows Server that allows multiple input devices to be used at the same time. The demo (above) links an MPX-enabled Linux system to a Mitsubishi Electric's DiamondTouch display table which can recognize four different unique users. The software is still in its early stages but shows significant promise, as an open source version will open up more application development, which is vital, and bring down the price of such systems, which is even better. Combined with the new touch technology from Hitachi Displays (below) and its ability to make large panels, there is definitely significant potential for this technology. Here's a strange story for the electronics industry. A struggling games machine maker is now worth more than one of the strongest brands in the consumer electronics industry. That's right, Nintendo has overtaken Sony - maker not only of the Playstation, but TVs, audio, PCs etc etc - in market capitalisation on the strength of the Wii games machine to be come one of the top ten most valuable companies in Japan. The Wii is a great design and a lesson in providing what people want rather than the latest technology, but Nintendo is vulnerable to a downturn through being a one-trick company. Nintendo is now aiming to overtake Sony's 120m-selling PlayStation2 - Nintendo sold 5.8 million units of the Wii by this March, and aims to sell another 14 million during the current business year to March 2008, which makes 20m this year, so it will take four to five years to beat the PS2. That's a long way off, and competition is fierce and Nintendo still hasn't sorted out it's production scheduling problems. This just goes to show, rightly or wrongly, the madness and emotion of the stock market! A Taiwanese consortium Openmoko, led by embedded electronics giant FIC, has launched its Linux 'open' phone, Neo 1973, named after the year FIC claims the mobile phone was invented. * USB 1.1, switchable between Client and Host (unpowered) - interesting! This incarnation will not work as the applications are not available that the operators demand, but this is the start of a more open generation of mobile phones using Linux that will stimulate the eco-system of mobile phone applications (and viruses of course) and eventually drive down the costs of smartphones, but it will take many years! All credit to FIC for starting the ball rolling in a serious way, and these guys know how to manufacture in volume to a price! The e-paper display business will surpass US$2.0bn a year in five year and surpass $4 billion in 2014 according to a new report from market researchers NanoMarkets. It expects that the arrival of high-quality colour e-paper technology, better encapsulation and the ability to print large e-paper displays will create new opportunities in smart shelves, point-of-purchase (POP) displays, cell phone displays and disposable electronics. · Non-electrophoretic materials to gain market share: Both liquid crystals and electrochromic materials will grow in importance as platforms for e-paper, although e-paper displays based on electrophoretic materials will continue to take the largest share of the market. By 2014 e-paper made with electrophoretic materials will have reached almost $2.0 billion, with liquid crystal based e-paper at $1.5 billion and electrochromic e-paper at just under a $1.0 billion. · More e-paper in cell phones: Cell phone sub-displays - and eventually main displays - are the high-volume opportunities for e-paper firms. Motorola has already been quite successful with its Motophone, the first cell phone to use e-paper. The best thing that e-paper makers have on their side in the cell phone market is the ability of their displays to be read in sunlight, an advantage that no other display technology can provide. By 2014 the cell phone sector will generate $763 million in e-paper display revenues. · E-paper perfect for pricing displays: Smart shelves and POP displays are a "tremendous opportunity" for e-paper, enabling stores to change shelf prices from a central location for promotions, adjust for changes in wholesale pricing and make corrections when pricing on the shelves is incorrect. E-paper's low power consumption means this displays can be run from batteries and its flexibility makes it easy to fix to shelves and walls. By 2014, NanoMarkets expects e-paper to generate $1.2 billion from this sector. From my story on the front page of Electronics Weekly this week, new touchscreen technology from Hitachi Displays is set to make a real difference to the way mobile phones are designed and used. Hitachi has developed a new passive technique for touch sensing on mobile phones that does not involve the traditional sensor technologies such as resistive or capacitative sensing. This is a key area where mobile phones in particular fail and could make touch screens much more reliable for use in many different applications. 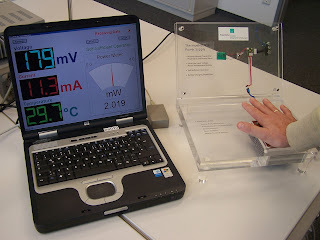 The technique uses ordinary thin film transistors (TFTs) around the edge of the screen that can detect a change in light when a finger touches the screen. Algorithms are then used to sense where the finger is. This is all integrated into the display, adding touch screen for little extra cost. “We want to develop a touch sensor without any mechanical components,” said Matt Tapping, sales manager at Hitachi Europe. Hitachi Displays has developed a prototype system and is planning production for the end of next year. 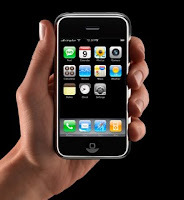 However, at the moment this technique would not be able to handle the newer techniques such as ‘pinching’ used on the Apple iPhone (see below). “This would have to be used for soft keys,” said Tapping. Future versions could support the more complex user interfaces I expect but that would need more transistors and more complex detection algorithms, and devices such as the iPhone will be able to support premium prices for touchscreens anyway. But the potential of this is huge, as this technique can also be used screens for all sorts of applications including digital TV where cost and reliability of touch screens have prevented new user interface techniques being used. Hitachi is shipping a wide VGA screen (see below on VGA screens coming through) to KDDI in Japan for its AU model, particularly for Web browsing. The 864 x 480 screen is an odd size but this allows full screen 800 pixel wide Web pages and leaves 64 pixels left on the side for icons! Website ifixit.com to an iPhone apart to find out what was in it. Much of this has already been suggested (Marvell's wifi chip rather than Broadcom's, the Infineon S-Gold GSM/EDGE phone chip with ARM processor) but it is all in one place and confirms things like the memory and applications processor from Samsung, DAC from Wolfson in Scotland and Bluetooth from CSR in Cambridge, and power amplifier from SkyWorks. This of course means that this stripped down variant of the OS X operating system for the iPhone (embedded OS X, if you like) has been ported to the ARM architecture for the Samsung chip, a 700MHz ARM1176JZF core, and so could run on TI's OMAP chips, for example, or many other ARM microcontrollers. This is potentially great news for embedded system designers. The bad news is that Apple as said it won't be released to the outside world. Shame. * Samsung chip underneath the metal shield on the left side of the board on the left. Ours reads K9MCGD8U5M. The 4 GB model that Think Secret took apart had K9HBG08U1M on it, which is a 4 GB chip. * Samsung memory stacked with an ARM-architecture processor, Part number 339S0030ARM, 8900B 0719, NOD4BZ02, K4X1G153PC-XGC3, ECC457Q3 716 shows it to be a Samsung processor rather than a Mavell Xscale. The processor is likely stacked on the SDRAM, which could be two 512 Megabit chips. The processor could have H.264 and MP3 hardware decoding built in. * The chip above the ARM is a Wolfson audio chip. Part numbers WM8758BG and 73AFMN5. * The chip underneath the ARM is a Linear Technology 4066 USB Power Li-Ion Battery Charger, which Apple uses in the iPods as well. * The chip on the bottom center has this text: MARVELL, W8686B13, 702AUUP. This is Marvell's 802.11b/g 18.4mm2 chip. * The silver chip to the left of the Skyworks chip reads CSR 41814 3A06U K715FB. This is a CSR BlueCore4-ROM WLCSP single chip radio and baseband IC for Bluetooth 2+EDR. * The chip with the blue dot on it is rumored to be an Intel Wireless Flash 32 MB chip. Part numbers 1030W0YTQ2, 5716A673, and Z717074A. EE Times adds the part #PF38F1030W0YTQ2. * The chip in the lower right some claim this is an Apple-branded chip, but it's purpose is currently unknown. * The chip in the lower left is an Infineon PMB8876 S-Gold 2 multimedia engine. Part numbers: 337S3235, 60708, and EL629058S03. While Steve Jobs and the iPod is about carrying your 'entertainment state' around with you, Sanjay Jha of Qualcomm (above) has the vision of carrying your 'computing state' around with you. This is the idea behind Snapdragon, a chip that will combine computing, networking and possibly communications, and allow you to carry around your computing state - you plug the unit into a screen and keyboard and hey presto! It's a bigger version of the Yoggie PC-on-a- USB stick idea or LSI's pocket Bluetooth server, but it changes the way we think about consumer products. At a recent 'Wireless Symposium', Cambridge chip startup Artimi was demonstrating its Wireless USB capability, linking a digital camera via a USB port to a dongle, to another dongle plugged into a PC. So my apologies for my face coming up on the screen! Artimi is focusing on the cable replacement market, and linking things like external hard disk drives and cameras wirelessly. Much as I wish them, and any chip startup, well, I worry that there isn't the margin in the market for these devices. Yes, they point to HDMI cables costing $70 to $100, and that's where companies such as Pulse-Link are aiming, and that makes sense. But will people pay $50 for a pair of dongles to replace a $5 cable? No. So the issue comes down to the consumer equipment makers and getting these chips designed in - Artimi is claiming some success on this front, especially with the hard disk makers, and if we see this starting to happen by the end of the year, or Q1 next year (which is possible) then cable replacement becomes feasible. Microsoft has followed the Apple lead and done some really neat software for the user interface (for once). The Surface is a table PC (which has been around in places like Bristol's Watershed for years) but now adds a touch screen software for that surface (hence the name). One demo shows the use with a phone (above), linking automatically via Bluetooth when placed on the table and easily transferring pictures to and from the phone. Brilliant! The other shows a group working on the same set of photos, moving and manipulating them by hand (below). The main thing I would worry about is the lifetime of the touchscreen and the initial costs - for a lot of the corporate applications (with the high price) a vertical touchscreen seems better, and we have those already. The phone example, which needs a table, is more suited to the home or casual environment and I'm not sure this wil be priced for that market. Could you fit a PC into a USB stick? Israeli startup Yoggie Security Systems has done that, creating a 500MHz Linux computer in your pocket. The Yoggie Pico uses a 520MHz processor from Marvell (the former StrongArm PA processor line from Intel) and it runs the full Linux6.2 operating system. This allows Yoggie to provide 13 security applications such as anti-virus, firewall and anti-phishing in a USB2.0 stick to protect notebook PCs. All the network traffic runs from the modem or wireless LAN through the stick controlled by a separate memory engine in the notebook, not the central processor. “The bottleneck is always the network and not the PCI bus or the USB, and that’s why there is no degradation in performance,” said Shlomo Toubol, founder and chief executive of Yoggie. The signatures and rules are updated automatically by the stick every five minutes. The operating system is kept secure in a protected 128Mbyte flash memory chip and loaded into another 128Mbyte flash to execute to prevent hacking. It runs with128Mbytes of DRAM memory. Three of the applications have been bought in, including the anti-virus with regular virus signature updates, while the others have been developed in house or are open source, says Toubol. The company is about to appoint distributors in the UK for both consumer and enterprise applications. For companies, the USB stick can also be used to prevent access to Websites and to prevent the PC being used without the stick, but there is password protection so the PC could be used in an emergency. The potential however is for this to be a very compact portable PC that just needs to be plugged into a screen, keyboard and network connection, and Yoggie is looking at new applications. The deadline for the 2007 Young Engineer for Britain entries is approaching on May 31st. This comes hot on the heels of the news that two previous year’s winners went on last week to scoop top prizes amounting to $19,500 at the Intel sponsored International Science and Engineering Fair (ISEF) in Alberquerque, New Mexico. Andrew Nowell (19) from Nottingham and David Badger from Sheffield won the right to travel to America as part of their prizes from the 2006 Young Engineer for Britain competition last September. The Young Engineer for Britain has a £2,000 top prize and the opportunity to emulate Andrew and David’s success in America. Eleven regional judging events begin in Belfast on 12 June and finishes at the University of Sunderland on 17 July (see below) and each regional event itself offers a range of valuable prizes, including a new award from REKTN (Resource Efficiency Knowledge Transfer Network) for the project doing the most to sustain energy. The regional finals also provide the opportunity to qualify for the National Final, which takes place at the Annual Celebration of Engineering at the Old Royal Navy College in Greenwich on 17 September. groups: 12 -16 and 16 -19. The awards categories are design and innovation; product development and marketability; engineering craftsmanship and finish; integration and application of electronics. Regional winners in each of these categories can win £150, whilst national winners can win £800. Overall regional winners receive £200 and automatically qualify for the national final and there are a number of wild cards at the discretion of the panel judges, who are drawn from industry and who specialise in one or more of the judging criteria. All cash awards are shared between students and their schools. Schools have been able to enter the 2007 competition on line at the Young Engineers’ web site www.youngeng.org. "There is still time to enter this major competition, which sets out to identify the nation’s top young engineering entrepreneurs. Much has been said about the importance of engineering to the future of the country and by entering this competition, students can make a vital start on this path,” said Young Engineers’ Project Manager, Joanne Phillips. Communications chip maker QUALCOMM has teamed up with a Taiwanese Bluetooth headset maker to integrate Micro-Electro-Mechanical Systems (MEMS) displays into the next generation of Ubixon's stereo headsets. The reflective displays, based on Interferometric Modulation (IMOD) technology, require no backlighting and can be viewed in bright sunlight and in a wide range of environments and are lower power than other display technologies, claims Qualcomm. Details are very sketchy, but this sounds like a display attached to the earpiece, forming the User Interface (and these direct displays work better close to the eye). The problem is then getting all that display data over the Bluetooth link, although with more memory in the earpiece it could just send updates. Great for a more static display, which would use less power and not be so sensitive to switching speed. This also ties in well with Qualcomm's SnapDragon chip to add more computing to phones and consumer devices. MEMS uses semiconductor-like and thin-film manufacturing processes to produce tiny and highly reliable mechanical devices for the displays with micron resolution. "We are excited to work with Ubixon toward the common goal of delivering innovative solutions to end users," said Dr John Batey, vice president and general manager of QUALCOMM MEMS Technologies. "With the delivery of the industry's first direct view MEMS displays, we are providing technology that enables mobile devices to be used in more environments and for more hours per charge, thereby enhancing consumers' user experience." Ubixon started with headsets but is an emerging developer of ubiquitous portable consumer devices. Headquartered in Seoul, its parent company Uclick is a South Korea-based financial Internet portal and technology company. A wonderful pastiche of the 'V is for Vendetta' and 'The Matrix' film genre from MBA students at UNC's Kenan-Flagler Business School in the US who have obviously talked to the more aggressive, grasping VC funds! Includes classic lines like - "Remember - use 5 times EBITDA" and other sad phrases but highlights the challenge of dealing with people who are much more experienced with money! Broadcom is licensing processor cores from the two arch competitors ARM and MIPS Technologies. It is licensing the ARM Cortex-M3 for wireless designs and the MIPS 74K announce today for designs over 1GHz such as digital TV, set-top boxes, next generation DVD players/recorders, broadband access, PON, residential gateways and VoIP. Broadcom was the first to license the 74K core in January as an early access customer. “The rapid convergence of digital devices and the emergence of new consumer markets, including IPTV, HD DVD, Blu-ray Disc and 802.11n, are driving the demand for superior performance, lower system costs and low power consumption,” said Jack Browne, vice president of marketing at MIPS Technologies. However this is a complex beast with a 17-stage pipeline employing a combination of out-of-order dispatch and asymmetric dual-issue. This gives the higher frequency and higher performance with lower area and power, with 1.7sq mm core area and 0.76 mW/MHz in TMSC's general purpose 65nm process. Broadcom is using the ARM M3 in a multiple-use licensing agreement for wireless LAN (802.11g,b and n,presumably) and Bluetooth. The key is the Thumb2 instruction set that combines both 16bit and 32bit instructions to keep code size down. “The superior code density of the ARM Cortex-M3 processor enables a reduced memory footprint while delivering significant performance advantages over existing designs,” said Robert Rango, Group Vice President and General Manager of Broadcom’s Wireless Connectivity Group. Late last week saw Motorola continuing to strengthen its position in video by acquiring Modulus Video (I don't really think it's a merger, given the relative sizes of the companies). These guys have been developing great video compression algorithms and systems purely focussed on H.264/AVC for IPTV, cable, broadcast and satellite systems, such as the ME2000 SD/HD encoder above, and has been working with Motorola for the last two years anyway. This now combines Broadbus, Kreatel, Tut Systems and Netopia for an integrated, end-to-end video delivery system for multiple network architectures. As ever it will be a potential problem for existing Modulus partners such as Sencore, who supplied decoders to them, and other customers, although they were never big on saying who those customers might be. More of a worry would be Mark Magee, the VP Technology & Chief Architect and Co-Founder, who has avoided Motorola before. He worked at Compression Labs Inc, which was acquired by Motorola / General Instrument, and was before co-founding Modulus Video, he was VP of Engineering for DiviCom (acquired by Harmonic). There he was the architect of the DiviCom MPEG-2 encoder and multiplexer and helped define and develop other DiviCom core products, leading a team of 180 engineers across three R&D centres: this is a man who has done the big teams and the startups and should not need to work now - keeping his expertise will be an interesting challenge for Motorola. But hey: "Our team will benefit from Motorola's rich heritage and leadership of video delivery expertise," said Bob Wilson, Chairman and CEO of Modulus Video. "Modulus Video will bring to Motorola a software-centric platform that ensures flexibility, reduced cost and fast development time." "Motorola is committed to offering an integrated, end-to-end video portfolio designed to meet the current and next-generation requirements of operators," said Dan Moloney, President, Home and Networks Mobility business at Motorola. "As consumers demand more high definition video and interactive services, the need for advanced compression technology is increasingly important. As part of its advanced real-time video encoding products, Modulus Video has a powerful architecture and product development framework that is well suited for continued technological advancement." US startup Electric Cloud is looking to Europe for its international expansion to tackle the complexity of embedded software. With different versions for different products, different countries and different operators, companies like Nokia can have up to 3000 different versions of the software for their phones. This is all constantly being updated and needs to be managed to make sure they all operate correctly and are put into the right phones. The company has developed technology for handling all these different variants and their updates, which can be daily. The company is focussing on silicon chip and equipment suppliers in the mobile phone arena. 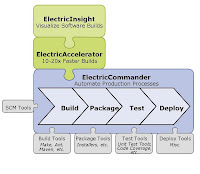 The ElectricCommander tool manages the software builds, while the ElectricAccelerator uses patented technology to accelerates the builds by spreading them across multiple computers in the network, cutting build times from hours to minutes and saving significant time with thousands of builds. The ElectricInsight tool provides visibility into the builds by mining the information produced by ElectricAccelerator to provide an easy-to-understand, graphical representation of the build structure for performance analysis and optimisation. Companies such as Agilent Technologies, Force 10, Intuit, Kyocera, LG, LSI Logic, Mercury Computer Systems, Motorola, Qualcomm, and Samsung already use the tools in the US and the company has set up its European headquarters in Oxford, UK and has appointed Andrew Patterson its European business director. IBM has developed a technique for the ‘self assembly’ of air gaps around nano-scale wires, using them to act as the dielectric to speed up performance. Researchers at IBM’s Almaden Research Centre in California and the T.J. Watson Research Centre in New York state used a mix of compounds that is poured onto a silicon wafer with the wired chip patterns, then baked. The compounds self assemble to create uniform holes 20nm in diameter around the wires, creating a vacuum dielectric. Test chips use 15 percent less energy or run 35% faster, and the technique is expected to be used in the POWER server chips in 2009. See more on IBM and HP nanotechnology here. I suppose it was inevitable, but the first refrigerator with High Definition TV has finally arrived. Announced in November but launched yesterday in the US by LG of Korea, the $4,000 fridge integrates LG's fifth-generation ATSC-QAM-NTSC digital television tuner to pick up terrestrial or cable HD. The only problem is, it displays it on a 15-inch LCD screen. Whether people will pay the premium for HD on a small screen fridge is debatable, although there are always the 'bleeding edge' consumers.I guess the absence of any other competing fridges, even with a seven month lag between announcing and shipping, says something about the expected demand. And harking back to the first 'killer app' for the home computer, storing recipes, the LG Recipe Bank has 100 pre-loaded recipes from the Culinary Institute of America. "As an appliance industry leader in digital convergence, LG Electronics is constantly seeking out ways in which we can create innovative, stylish and functional products," said John Herrington, president of LG Electronics USA, Digital Appliances. "LG is taking this innovation one step further with the introduction of our HDTV Refrigerator by incorporating additional features that further enhance the user experience, from LG's industry-leading digital TV tuner to the Weather & Info Center for weather forecasts, uploadable photo album and recipe bank." And of course it has an ice generator! NXP Semiconductor and Kestrel Wireless have teamed up to add RFID tags to consumer equipment, including DVDs, to prevent theft, in a very interesting story. The key is that the RFID chips activate the equipment at the point of sale, so stealing them is useless. And it fits nicely into the existing point of sale infrastructure - so far, so good. Now this I can understand for an MP3 player, falt screen TV, even a electronic toothbrush, but how on earth does an RFID tag disable or enable a DVD, which is passive? It turns out there is another factor floating around here - an electro-optic film has to be added to the DVD, and this is activated by the RFID tag. Now, there are some distinct issues here, not least the power required to activate the film quickly and effectively, which is not possible through existing point of sale RFID terminals. An then there is the cost of adding the film to the DVD (both in itself and the manufacturing process) which will be non-trivial - this is not just a piece of plastic on top of the disk. And what about reliability - will the film slowly darken over time? I suspect there's a long way to go on this! Altera has launched its FPGAs into the higher volume market for PCI Express (PCIe), Gigabit Ethernet (GbE) and Serial RapidIO (SRIO) by 'recycling' its existing higher performance parts. The 2.5Gbit/s ArriaGX parts are based on the same die as the existing 6.25Gbit/s StratixII GX parts, but run at a lower speed (reducing the test and support costs) and use lower cost packaging. This has significantly reduced the cost of the parts, putting it just 20% more expensive than the low cost Cyclone 3 family. The five members of the family provide up to 12 full-duplex transceiver channels and start at $50 for the 50,000 logic element (LE) part. The family ranges from 21,580 to 90,220 logic elements, up to 4.5 Mbits of embedded memory and up to 176 multipliers, and is built on TSMC’s established 90-nm process. The parts are included in the latest release of the Quartus II design tool, released today, and because these are based on existing die, start shipping in volume next month.